Avant-garde composer John Cage, greatly looked up to his teacher Schoenberg as a model of how a true artist ought to live. At the same time, Cage inspired generations of artists both through his work – which incorporated elements of chance into his music – and through his teaching. Sister Corita Kent, an unlikely nun artist in the Los Angeles art scene, and instructor at Immaculate Heart College was one of those whom Cage inspired. In 1968, she crafted the Ten Rules for Students and Teachers for a class project. 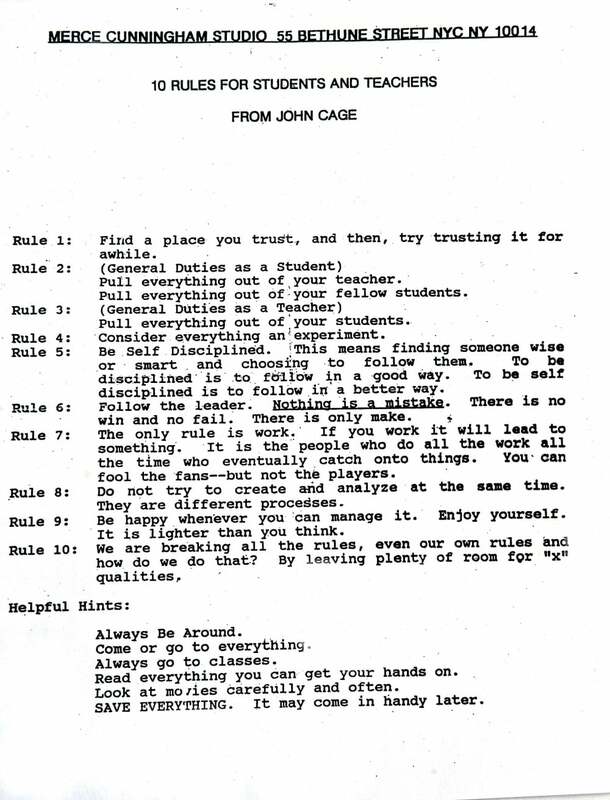 Cage was quoted directly in Rule 10, however he did not create the list. In any case, he was pleased with it and popularized the list. Cage’s lover and life partner, Merce Cunningham posted a copy of it in his studio until he died.